There are some days when the afternoon seems endless. It could be that I'm not feeling well or I just don't have the energy to make it through the day. Of course, I workout and eat well, but some days you need a little extra boost. Recently, I've tried a new supplement to get over my afternoon blahs, Body Works. Body Works is a functional beverage company. Having had success with its other offering, Relaxzen, Body Works expended its line to include functional shots for a variety of life's situations. Created by a staff of doctors, nutritionists and fitness experts, these powerful drink shots help the user combat what life brings him. Since my days vary from busy to peaceful, I wanted to try several different options. The first shot that I tried was the Sports shot. Since I workout at least 5 days a week, I know that recovery time is very important to my workout schedule. With a heavy, long spin class on the calendar, I had a shot in the morning before I left. The Sports version is intended to not only provide energy during your activity, but it aids in your hydration and recovery post workout. I noticed that my workout seemed to fly by (sometimes that 60 minutes drags). More importantly, the next morning my legs felt limber and definitely not sore. The other drink that I tried was the energy shot. If you have ever tried to shovel heavy, wet snow, you know that it is exhausting work. With the big storm, and lots of shoveling, on the way, I tried the energy drink. I was able to clear the driveway without feeling completely drained. Body Works offers several varieties of shots. These include Wellness, Sleep, Sport, Energy, Perform Under Pressure and Relax and Unwind. All of these products can be purchased on the website in 6 or 12 pack options. These packs can be mixed and matched. 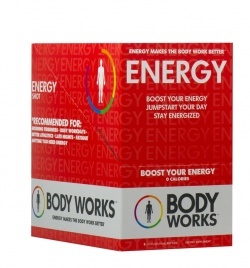 If you are ready to try a new supplement to your lifestyle, check out Body Works. It just might make your day a little better. I've tried products like this before, but this sounds interesting! !